The mobile app that you build communicates with the AppSheet backend, and it is the AppSheet backend that communicates with your cloud data provider (eg: Google Drive) to read or update data. For security reasons, cloud data providers only let AppSheet access your data after you grant AppSheet permission to do so. 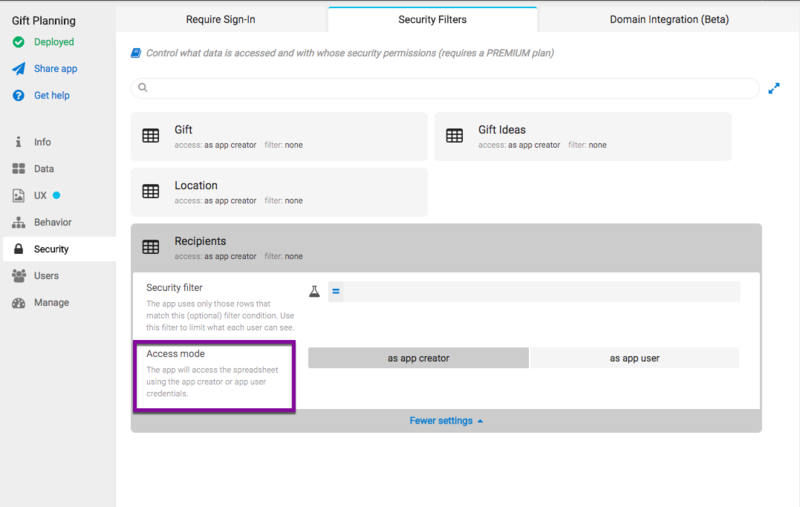 Whenever a user or app creator signs in, they grant AppSheet the permission to act on their behalf. You will find Access Mode in Security > Security Filters under More Settings. You can set access mode per table. For example, in the image below, access mode can be customized for the Recipients table. In the default run mode ('as app creator'), AppSheet accesses data using the identity of the app creator. If you as the app creator have access to the spreadsheet, you can distribute your app to other people who do not have direct access to the spreadsheet. Most users choose 'as app creator' because it allows them to restrict direct access to the spreadsheet to solely the application creator. You can set the run mode to 'as app user'. In this mode, AppSheet will access data using the identity of the app user. The application must require sign-in, and all application users must have permission to directly access the source spreadsheet and folder. What are the benefits of 'as app user' run mode? Some users view it as a stricter security mechanism because it relies entirely on the permissions model of the cloud data provider. It can be an auditing mechanism for cloud providers, like Google Drive and Box, that maintain audit histories of all updates made to documents. Each audit history record contains the identity of the user who made the change. This option has no bearing on the identity of the user on the mobile device. The user who signs in is always the current user therefore expressions like USEREMAIL() always reflect the current signed-in user, never the app creator.